Major Change: February 19. If you've already installed prior version of this UI, the latest version has been extremely streamlined. Before you install this update, delete your current custom directory. Discuss this interface here. If you ever have any questions concerning it or what I've done, don't hesitate to ask. The original TyeJae Steel was designed for a resolution of 1024x768, however, this one is designed for use on 1280x1024. If you wish to use it at the lower resolution, simply delete the eq2ui_journal_active.xml from the custom directory. This will remove the skinned active quest window and allow you to move the default where you want it. Instructions on how to install the UI (DO NOT USE THE /loadui COMMAND) can be found at http://www.eq2interface.com/forums/showthread.php?t=293. Remember to unzip the file with "use directory structure" checked. Version 2 Targeting - the new targeting system (Frames "Simple") is now supported. Grey dots indicate solo and group mobs, while red dot overlays indicate raid mobs. Silver Interface - Incubi Silver - optionally replace all the gold frills with a silver look. Unzip the included silver.zip to the images directory to install. Ammo - keeps a running count of the ammunition currently equipped. It is NOT interactive - simply a visual indicator. See install.txt for additional installation instructions. Bags - sized down much smaller with no frill. Can be stacked like legos to fit all bags open on your screen. Chat windows - by Deathbane27 No frills. Use the "Frames / No Frames" dialogue to remove the chat bar for windows that aren't used for input. Supports tabs. Inn Room Window - by Quib (i think) Use enter key to pay rent / enter room. Safety button added to relinquish / collect items. Personal Merchant - by Quib - Select item and press new search button to auto-search the market. Also included is Quib "Just-Press-Enter" market search. Map - EQ2MAP project. includes interactive maps of zones not normally mapped by default. overlays for multi-level zones and points of interest. Keep this up-to-date at http://maps.eq2interface.com. Credit and props go out to TyeJae, who designed the original steel HUD, and Perdition who has made many additions to TyeJae's ui. 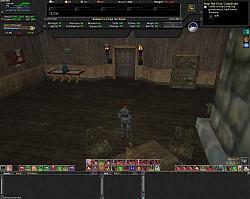 Many of the other mods in the ui were originally created by various coders at EQ2Interface. I tried to give credit where I remembered. Visit http://www.eq2interface.com for more ui mods. It's beautiful, but is there a click to cure feature? I am hesitant to get away from my current UI because I am so dependant on that. I just got the same problem. It almost loads, then crashes with an error. Any ideas? oh yea, when i finally get in..it says im a level 50 shadownight everything is maxed out..and it just exits eq2 saying an error..maybe cause i used /loadui andi t exited when i used /loadui is there anyway to refix this? Last edited by artie : 10-28-2005 at 09:53 PM. When logging in..the screen where the text box is..is just black i cant see anything.. i dont kno whats going on. I dont have a bad computer, just a bad gfx card and its relitively playable in 1024 but I have to use 2 resolutions higher to use this. Which means I have to turn all my D3D settings down, which then makes the gui all smooth and blended in. Doesnt look very good but its the only way I can play with a decent GUI and good FPS. The only thing I would love to see is the updated version of TyeJae's HO wheel. It looks awesome! whats about the post system ? i still just see an black box if i open it, any1 knows advice ? It appears that a patch today pushed some changes to the bag window xml increasing the size of bags with a large number of slots. This has caused problems with some custom bag interfaces not allowing people to view all the slots of the large bags. A temporary fix so you can see your entire bag is to delete your custom eq2ui_inventory_bag.xml file. Please watch for updates to your interface. from last patch I'm not able to see more than the upper part of the upper row of any box or bag :-(.. so it's clearly impossible to have access to anything.. how may I can fix that please. Those people that are crashing due to using a custom interface please look in your custom UI folder and remove the file eq2ui_examine.xml until the author of your interface mod updates it. People with trouble typeing in the market windows and other various windows need to delete their custom eq2ui_fonts.xml until the author updates that file for them. Those that have copied the entire default folder into their custom folder will have major problems. If you did this you will need to delete your current custom interface and re-download it then install it using the directions in our FAQ. Never copy the contents of the default folder in to your custom folder. I have no doubt your working on fixing, if you are aware of this..
i have same problem... i hope he work to solve this problem i really love your UI and dont like back to default.